Join Point B Realty in celebrating it’s 7th year of the Martha’s Vineyard Teddy Bear Suite. Children let their imaginations fly visiting the hundreds of bears dressed in holiday their best. The event is a magical tradition where memories are made. New this year – don’t miss the opportunity to win a big teddy bear of your own. 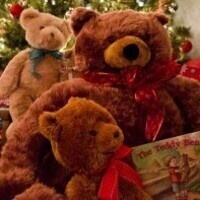 Teddy Bear Suite Raffle will run for the entire month and can be found at Rosewater Market & Take Away. Winner will be selected on Dec. 20. This is a fundraiser for the Martha’s Vineyard Boys & Girls Club.